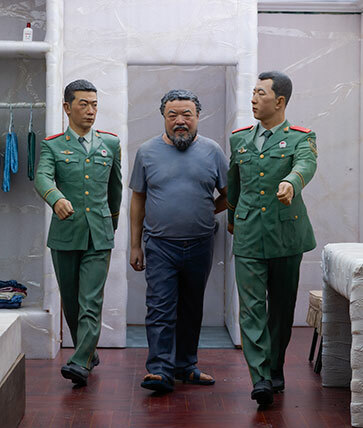 For sure the best part of the Brooklyn Museum’s current exhibition of Ai Weiwei‘s (pronounced Eye Way-Way) retrospective – “According to What?” – is that it was able to obtain the six dioramas Ai made of his 81-day detention by Chinese authorities. The dioramas visually demonstrates the utter absurdity of the Chinese police state. This alone mandates that this exhibit not be missed. But the second best part? That the Brooklyn Museum did not place Ai’s works in a vacuum. Instead, Ai’s exhibit is one of four fascinating exhibits concerning art and social activism. Any visit to Ai’s exhibit should be accompanied by a viewing of at least one of these other shows. If you get there before July 13, definitely check out “Witness: Art and Civil Rights in the Sixties” as a contrasting exhibit to Ai’s and as a powerful reminder of America’s own checkered past and unclear future concerning civil and human rights. his activism. One of the most revealing parts of the exhibition is Ai’s photographs from 1980s New York City, covering the decade when Ai lived in the city. 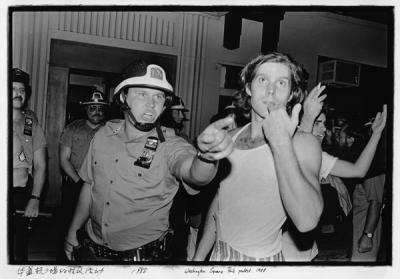 Through Ai’s photographs, we see what he saw: constant protests in various city parks, face-to-face confrontation with the police, the beginnings of the AIDs crisis and its activism, the grit of 1980s New York City. When later on in the exhibit you watch a video of Ai challenging the Chinese police and demanding accountability, you can’t help but think back to the photos of bloody protesters in Tompkins Square Park and wonder if this is what influences Ai to be the agitator that he has become. But Ai wasn’t always such an agitator. 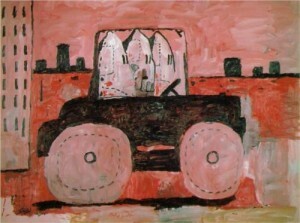 Unfortunately the exhibition gives only short shrift to his prior – and government-accepted – work. 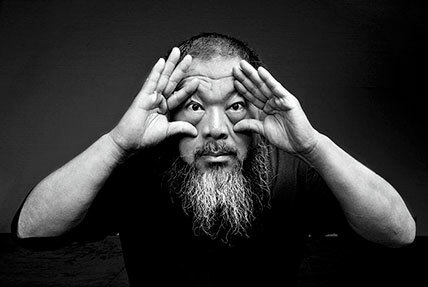 In overlooking this aspect of Ai’s career, the exhibit also fails to fully explain the spark that radicalized his art – the Sichuan earthquake. After an 8.0 magnitude earthquake rocked Sichuan province, Ai traveled to the region and saw the hundreds of shoddily-built schoolhouses that completely fell, killing the children in them. All the while surrounding government buildings remained standing. Seeing the thousands of children’s backpacks lying in the rubble and the fact that the government-controlled press was not acknowledging the “tofu-dreg construction,” Ai took matters into his own hands, undertaking a “Citizen’s Investigation” and uncovering the names of the 5,196 children killed. In “Sichuan Name List,” Ai lists the name, age, school and address of every single child killed. It is the layout of this work – the 5,196 names line an entire wall of the gallery, from top of the ten foot wall to bottom – that forms the art work. Only in seeing this can one even begin to attempt to understand the enormity of the loss. The work is accompanied by “Remembrance” a three-and-a-half audio recording of strangers from around the world speaking the name of every single child that perished. 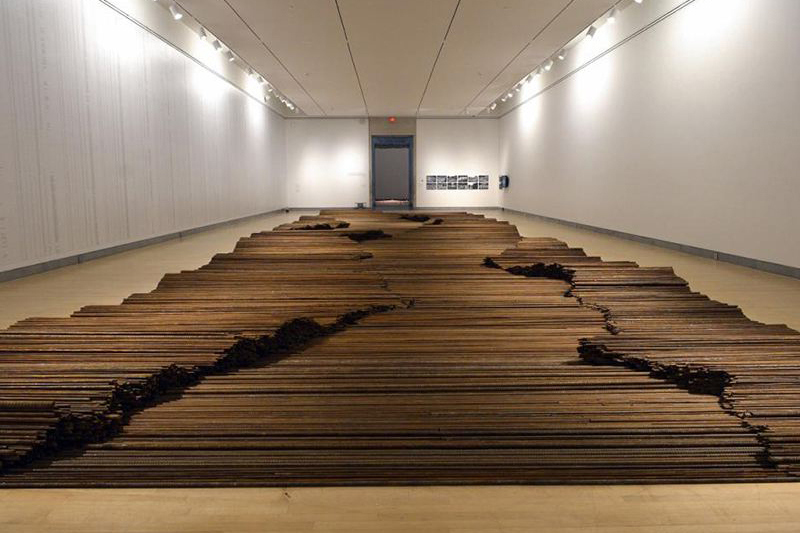 Lying in the center of the gallery are the steel rebar from the shoddy construction – all of which have been straightened back to their original form. Ai’s homage to the victims of the Sichuan earthquake is powerful. It is also the reason why Ai is so dangerous to the Chinese Communist Party (“CCP”). 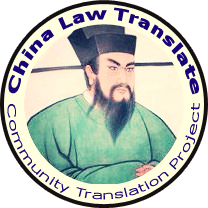 To maintain its power, the CCP needs to retain its monopoly on Chinese history. Since the founding of the People’s Republic, it is the CCP that writes the country’s history; not its people. Tiananmen? Never happened. Mao Zedong? Only 10% wrong. The Cultural Revolution? Not a descent into madness, just a little blip on the radar screen. Here, Ai – who is an influential figure since his father, Ai Qing, was a well-known and respected poet – is attempting to write the people’s history. It’s that attempt that the CCP sees as an assault on its rule. Never Lonely! Friendly little guards are there and everywhere! But if you think that is overreacting, then check out the six half-life size dioramas that Ai made of his 81 day detention. In 2011, Ai was detained by the public security bureau allegedly on tax fraud charges although the general consensus is that it was the government’s failed attempt to silence his activism. Ai designed each five-foot tall diorama with a window where the viewer can look in and see Ai in his room. In the first room, things don’t look so bad. It looks more like a hotel room than a jail cell. But as you progress and look into each scene, you begin to realize the absurdity of what is going on here. Two guards are with Ai at every moment, watching him. As he eats, as he sleeps, even when he showers. The guards are there, standing over him, watching his every move. Is this jolly, chubby man really that dangerous? With so much of Ai’s art involving his interaction with the authorities, “According to What?” raises the question – has social activism become Ai’s art? And is this good for either: should activism merely be theater; should art be so much protest? By situating “According to What?” with other activist art, the Brooklyn Museum has largely answered those questions – art does not exist in a vacuum nor should we want it to. For Americans, viewing “Witness: Art and Civil Rights in the Sixties” will demonstrate that art and activism go hand-and-hand and that we can and should respect the artist for both. It will also serve as an emotional reminder of our own dirty little past. But in the end, it will make you wonder – while these tactics worked in 1960s America, a largely democratic society, will they also work in Ai’s authoritarian China? One hopes that Ai’s art is not in vain, but, as China’s new regime even more violently cracks down on any purported challenge to its rule, only the future can tell. “Witness: Art and Civil Rights in the Sixties” is only on view at the Brooklyn Museum until July 13, 2014. “According to What?” is on view until August 10, 2014. This will be the exhibit’s final stop on its international tour. While entrance to the Brooklyn Museum is a suggested donation of $12, “According to What?” is a required $15 ticket (which includes price of general admission). Note that the dioramas of Ai’s detention are on the first floor before purchasing tickets and thus can be viewed for free.